Schiele studied at the Vienna Academy, coming under the influence of the heightened art nouveau of Gustav Klimt. He rapidly evolved his own style, redirecting the symbolist intensity of his mentor towards a more psychological, and indeed more modern, focus. In this Schiele echoed the new psychoanalytical theories of Sigmund Freud as well as his own subjective and often neurotic intimations. His view of human nature, graphically evidenced in the prolific drawings, paintings and prints that constitute his short career, was filtered through a prodigious eroticism. 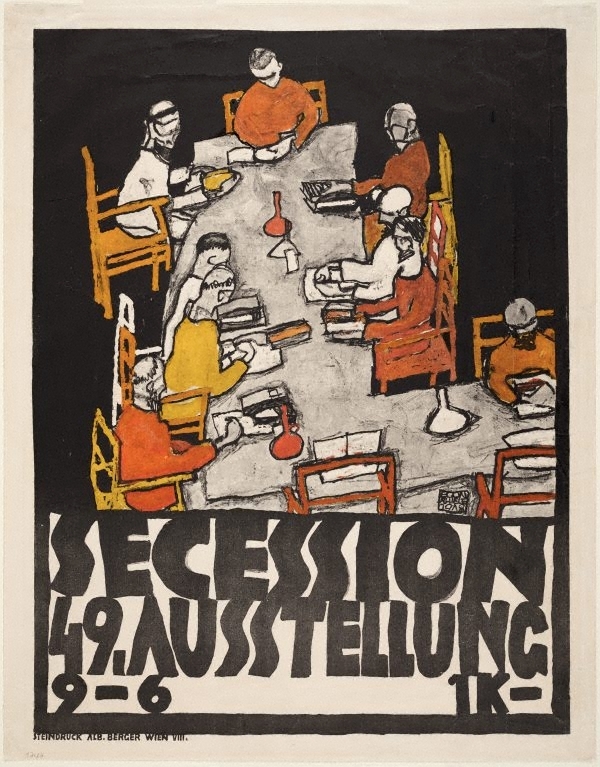 This poster for the last Secessionist exhibition in which he participated is based on a slightly earlier painting, photographically transferred to the lithographic plate before being reworked by the artist. Suggesting a Christ-like centrality not out of keeping with his personality, Schiele represents himself at the head of a table of friends, a number of whom have the tonsures of monks. Beyond its collegiate message, the print impresses as a formal arrangement of stark reductivity. Signed and dated c.r., [inscribed on stone] "Egon/ Schiele/ 1918".